Wood veneers are one of the popular interior materials, which are used to provide finishing to various wood based products. Wood veneer is a very thin slice of wood which is obtained from a tree log. It is glued on to different types of engineered woods such as plywood, MDF, blockboard, particle board, etc. to give a finishing and decorative look. Many interior designers use wood veneer to improve the aesthetics of kitchen cabinets. Wood veneer is available in different types, based on types of wood species, based on matches, based on cut, etc. There are various other reasons to use wood veneer. The most important is that it is economical than using solid wood. They are largely used in residential projects, hotel and office projects. Before using wood veneers in your home, you must be aware of advantages and disadvantages of wood veneers. Here we have given information on advantages and disadvantages of wood veneers, which homeowners must know before buying them. Wood veneers provide aesthetics like natural wood with less cost. As there is scarcity of natural wood nowadays, it has become expensive. Wood veneers are only thin slice of wood; they can be easily glued to an engineered wood substrate to provide wood-like aesthetics. Each wood veneer sheet is unique as each tree is unique. Even within a tree log, each layer is different. Hence there are endless design possibilities to give your furniture an exclusive look. In comparison to laminates, natural veneers can be customized with polish or varnish to change its shade from light to dark more easily. It helps to achieve edge and surface finishes with uniformity and gives a timeless look to the space. Apart from increasing aesthetics, applying wood veneer sheets to weak engineered woods like particle board can help in increasing its strength. Fiberboards like MDF and HDF are susceptible to damage in presence of water, hence applying wood veneer sheets will protect them from damage and increase its durability. It resists warping and fragmentation. Being natural product, it lasts longer than laminates. However, when wood veneer sheets come in contact with water, its polish may get damaged. It is an eco-friendly material and can be easily recycled. After its intended lifetime, wood veneers can be crushed to make wood waste which can be utilized in making particle board and MDF. Also Read: 8 Eco Friendly Building Materials Utilised in Green/Sustainable Buildings! Wood veneers help in better utilization of wood, as only a thin layer of wood is used to make furniture. 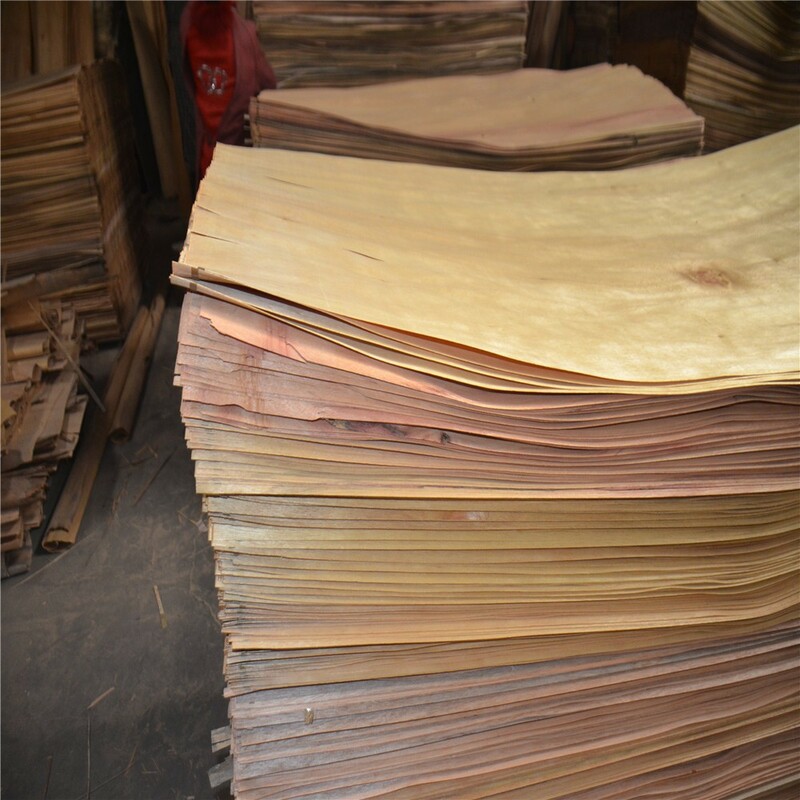 A tree log can be used to create only few pieces of furniture, while the same tree log can give you numerous wood veneer sheets which can be utilized as covering materials for many pieces of furniture. Unlike laminates, wood veneers are a natural product. They are generally non-toxic. Nowadays there are non-toxic adhesive available in the market which do not emit VOCs. These adhesives can be used in applying wood veneer to the substrates. Also Read: How To Apply Wood Veneer Sheets: Follow These Simple Steps! Over prolonged exposure to water, wood veneers can get damaged. Unless a sealant is applied on the surface, wood veneers are prone to water damage in wet conditions. Wood veneer sheets are not easy to install like laminates. They require skilled workers are air gap must be properly removed to get a perfect finish. Also the sheets are to be acclimated before installing, i.e. you have to keep the sheets in the room for 3 – 5 days before installing. Wood veneers require more maintenance and they need to be polished from time to time. For increased durability, they must be polished periodically. Unlike natural wood furniture which can be easily repaired by sanding several times, it is impossible to repair wood veneer. As it is very thin, once damaged cannot be repaired. Wood veneer is often overlaid on MDF or plywood which has a different expansion and contraction rate than the wood veneer on top. The result is that when the wood veneer naturally expands or contracts according to the climate changes, the material below it does not expand or contract at the same rate. It sometimes causes the wood veneer to crack. Wood veneers can provide an astonishing look to your home interior, if properly installed. They have become a popular material as they provide aesthetics of wood in less cost. They do not last more like solid wood furniture. After going through the above advantages and disadvantages of wood veneers, a homeowner must make judicial choice depending upon the requirements.